The Fígols-St. Cornelius basin located in Berguedà has one of the highest content of carbonaceous sediments in Catalonia. This is an area with great lithological diversity, with layers of sandstone, lutites, marl, limestone and coal. It is one of Catalonia's most significant areas for mining heritage and is currently undergoing restoration and adaptation to new tourism activities including the Cercs Museum of Mining. Fígols is located in the eastern Pyrenees, in the Pedraforca thrust sheet of the Vallcebre anticline. Lignite is interspersed in the limestones and marls of the Garumnià facies. The area presents a diverse geological facies with outcrops of sandstone, limestone and lutite marls of continental origin corresponding to those of late Mesozoic lake sediments. The limestone strata has interesting continental fossil fauna. Lignite has been intensively exploited in the region, despite being a low quality coal. This is a very sensitive area in terms of the socio-economic characteristics, since mining has been the basis of the economy for many years. Although the mines are now closed, their cultural presence is still very strong. The Fígols mines are part of the same mining district as Fumanya, and the coal levels correspond to the same facies. The mining town of Sant Corneli is one of the few settlements in Catalonia to retain the original architectural structure developed from mining activities. Sant Corneli still retains many original buildings and structures, and it has been possible to maintain a minimum population and recent tourist developments. Miners have conserved some elements that can be observed in the mining museum which is located in the town. The materials that emerge in this area are part of the Lower Perdaforca thrust sheet structure known as the Syncline of Vallcebre with a dip in the area of St. Cornelius of 30 º NW. The Garumnià Berguedà basin covers some 200 km² with a maximum depth of 850 metres. The sediments are around 70 million years old, corresponding to continental river and lake deposits. Coal is found in the Garumnià series above a white limestone base of between 5 and 10 metres in thickness. Above this are 200 metres of marl and limestone with intercalated carbon levels. Channeled sandstones and conglomerates outcrop with a depth of about 300 and continue with the Vallcebre limestone with a maximum depth of 100 metres. A 150 metre section of lutites and red loams then follows before the top of the series outcrops with about 100 metres of well-stratified limestone and marls. The geological significance lies mainly in the fields of mining and sedimentology. The Garumnià lacustrine facies are an excellent example for the understanding of the geological period between late Mesozoic and early Cenozoic. This includes the development of large lake areas in the Pyrenees, where abundant vegetation resulted in the formation of coal. This is one of the best locations in Catalonia to understand the formation of coal, its lake source and to recognise its characteristics and properties as a fuel. Moreover, an old mine can be visited to help an understanding of the exploitation of traditional resources. The subsurface geology identified in the mine can help in the understanding of the distribution and direction of the strata that we see on the surface. The mine is very popular with the teaching community who take advantage of the tours organised by the Mining Museum. It is also a regular stopping place for university geology groups. The exploitation of lignite began 150 years ago and from then until the end of the twentieth century, the whole alt Berguedà - villages, colonies and families - lived for mining and from mining. Major coal mining operations began with Carbones de Berga SA. The most widespread system for exploiting coal was through the use of galleries. From the middle of the nineteenth century until 1965, work was characterised by its danger and by the fact that it was basically manual. Maximum production was reached in the 1960s but it was not until 1965 that mining operations were mechanised. Decline began in the 1970s resulting in the closure of the Vallcebre and Fígols mines. Several projects have been initiated to revive the area, the most important of which is the Museum of Mines at Circs. The area is in very good state of conservation. All mining area are being restored using public and private investment to create a Mountain Park aimed at tourist and educational groups. The entire area of St. Cornelius Fígols bears the scars of mining but the impact in many areas has been minimized by restoration. Currently, the area presents no threats, with low visitor numbers to the mines and effective environmental and tourism management. The museum was inaugurated in 1998 and is linked to the National Technical Museum of Catalonia. It consists of an exhibition on coal mining and the associated mining colonies. 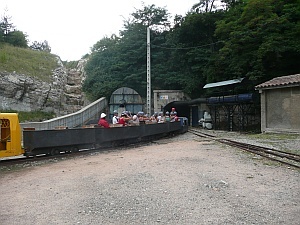 A mine gallery (Holy Roman) can be visited on a small mining train, which covers the different mining systems in chronological order. The permanent exhibition is divided into two areas: one about coal - the characteristics of lignite, forms of extraction and exploitation, transport, applications and uses - and another about daily life, focusing on social themes. The mining colony was founded at the end of the nineteenth century to house the miners and their families, using the industrial colony model already established in Catalonia. Today it forms one of the best preserved mining centres in Catalonia and in the whole of Spain. Visitors can also see a miner's home, a colony flat as it was in the 1940s. By 1950, as many as 3,000 people came to live in Saint Corneli, many of them immigrants from Andalusia. Life in the mining colonies was hard because of the isolation and the fact that their inhabitants were completely dependent on the mine and the mining company.